Fishing may be extremely beneficial to bluegills! 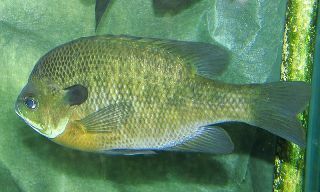 Overpopulated ponds and lakes have stunted bluegills in regard to size. 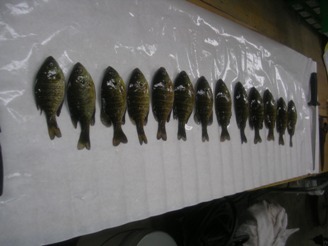 Fishing pressure allows remaining bluegills to have more nutrients for increased rate of growth. The opposite may also be true. 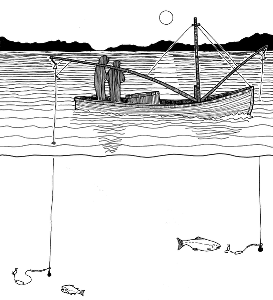 Many areas are over-fished. This causes a shortage in males and females at reproductive maturity. Do not be concerned! Every state has a department that regulates and manages bluegill populations. As mentioned in the habitat section, bluegills are present in numerous bodies of water across America. During spring months, fishermen generally have the best luck locating spawning sites. Aggressive males strike at nearly anything when they are guarding nests. Great bluegill fishing is not limited to spring months! At other times during the year, bluegills tend to stay in water that is 5 to 15 feet in depth (Holtan, 1990). Many anglers even do well fishing through winter ice. Make sure to check out your state regulations for daily bag limits. Because bluegills reproduce so efficiently, the limits are extremely generous! Bluegills bite on a wide variety of live and artificial baits. Some anglers use insects, earthworms, wax worms, or other worm species such as the red wiggler. 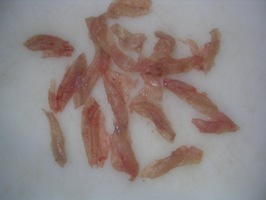 Others use a variety of manufactured baits that replicate small invertebrates. While bluegills are not picky eaters, they may have preference for certain baits on different days. As mentioned in the adaptation section, bluegills have small mouths. Therefore, it is important to use small hooks. Be prepared for a battle once they bite! Once harvested, bluegills provide an excellent meal. 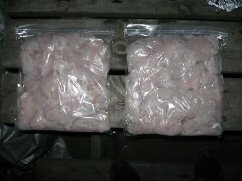 The white meat is high in protein and low in contaminants. Because they are low in the food chain, bluegills are not subject to high levels of biological magnification. Preparation can be done in numerous different ways. Regardless, the meal is destined to be healthy and delicious! Bluegills may be the most popular fish in America. In 2007, the Wisconsin Department of Natural Resources reported that anglers kept 25.7 million bluegills. In Wisconsin, the record bluegill was 12 inches in length, and weighed 2 pounds and 9 ounces. It is no surprise that the world record bluegill was caught in the warm waters of Alabama (Smith, 2009). That monster weighed 4 pounds and 9 ounces! The nutrition section describes the relationship between temperature and growth.